A linen crib skirt is timeless and classic. This neutral crib skirt is perfect for a baby boy or girl's neutral nursery. 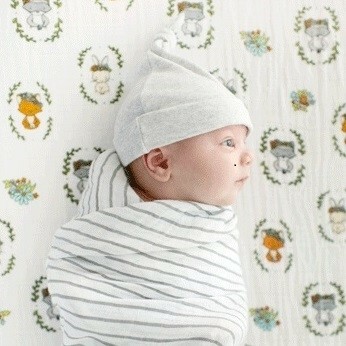 Traditional tailored gray crib skirt features pleats and accent buttons. • Drop length is 17". (Other skirt lengths available. Email us for pricing). • Split corners for easy placement inside of crib. • Four sided crib skirt fits around the entire crib. (Three sided crib skirts available. Email us for pricing). 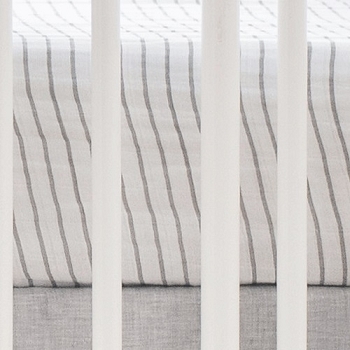 Coordinate your linen crib skirt with our Washed Sea Salt Gray Linen Crib Collection and our wide selection of cotton crib sheets.